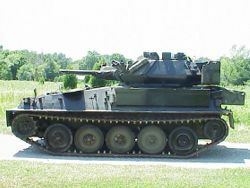 (click image for large view) The CVR(T) Scorpion , FV101, was the first in the series to be developed. It is most likely the smallest and fastest light tank in the world. The Scorpion was designed to replace the Saladin armoured car in the reconnaissance and fire support role. The first production vehicle was completed in 1972. By 1996 over 3500 of the CVR(T) series had been manufactured. - FV107 Scimitar Recon vehicle 30mm Gun These were the seven original variants manufactured. Since then there have been other variants including the Sabre (Scorpion with a Fox turret), Stormer, and the Streaker. The original seven variants were designed with the same basic automotive chassis and components. The Jaguar J60 XK 4.2 litre 6 cylinder petrol engine was selected for use due to its’ small size and light weight. The TN15X crossdrive semi-automatic transmission was developed for the vehicles from the transmission in the Chieftain MBT. The transmission is a 7 speed gearbox that allows speeds up to 50 mph according to the book. The armour used is an aluminum alloy developed for the CVR(T) series. The Scorpion was taken out of service with the British Army and replaced with the Scimitar and Sabre. The CVR(T) series was manufactured by Alvis LTD of Coventry, UK. New upgraded variants of this series are still offered for sale. For specifics on the variants see the separate vehicle listings.